What is a Paper Wasp? Paper wasps get their common name from the paper-like material out of which they make their nests. Paper wasps are sometimes called umbrella wasps, after the shape of their distinctive nests. Various species are found throughout the United States. Paper wasps are semi-social and live in small colonies. They eat nectar and other insects including caterpillars and flies. Paper wasps hang their comb nests from twigs and branches of trees and shrubs, porch ceilings, the tops of window and doorframes, soffits, eaves, attic rafters, deck floor joists and railings, etc. In the fall, inseminated females will seek places to spend the winter, and may find their way indoors, especially if there is a cathedral ceiling present. 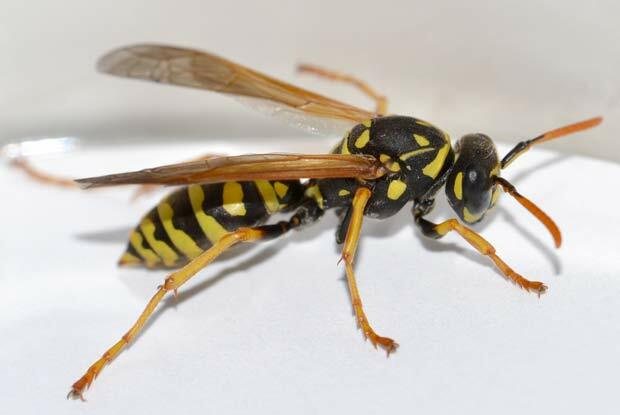 Unlike yellow jackets and hornets, which can be very aggressive, paper wasps will generally only attack if they themselves or their nest are threatened. Since their territoriality can lead to attacks on people, and because their stings are quite painful and can produce a potentially fatal anaphylactic reaction in some individuals, nests in human-inhabited areas may present an unacceptable hazard. Paper wasps are not an aggressive species by nature, but will sting if they are disturbed or their nest is threatened. Their sting is painful and has the same risk of allergic reaction as with other stinging insects. If you suspect you have a paper wasp infestation or find a nest on your home or property, contact a licensed pest management professional at Portland Pest Guard. Do not attempt to remove a nest on your own, as there is a high probability you will get stung.